GARDEN ROUTE ADVENTURES: Our day adventures of Abseiling, Rock Climbing, Canoeing, Guided Hiking and Kloofing are available to thrill, chill or challenge you 7 days a week and they’re great if you only have a day or two to spare. But if you want to make the most of the Garden Route, join us on our Knysna Slack packing trail, a fantastic Rock Climbing weekend at Montagu or on a sublime, guided Backpacking tour through the forest and along the coast. Browse through the adventure diary below and let us know if you’re keen to join us – or tell us what dates you have available. Looking for a little corporate ‘timeout’? Put the team through our Canoe Challenge on the Knysna Lagoon – hey, if you’re from out of town, let us know, we’ll arrange the whole thing for you, flights, transfers accommodation and of course ADVENTURE! GAUTENG ADVENTURES: As our Kloofing season cools down, the Rock Climbing season heats up, not sure if it’s for you? Try it out on our Introductory Climbing course, improve your skills on the Sport Climbing course or if you’re wanting to make a career our of mountaineering ask us for the info on our professional courses. Have you had your adrenalin fix at our Abseiling site in Cullinan – conveniently close to Pretoria? It’s fantastic, an excellent option for an adventurous Birthday Party or even a corporate day out. The popular introductory special at this site is still available till August this year. Email us for the details. All our adventures are available every day of the week. DRAKENBERG ADVENTURES: Nothing like the feeling of the fresh chill of the Drakensberg breeze to heighten the thrill of your Sentinel Peak climb, join us in on this spectacular climb and feel for your self. If you prefer to keep your feet on the ground enquire about our Amphitheatre Trek, don’t miss an opportunity to trek in a bit of snow in June or July on the Northern Drakensberg Traverse or if your keen to tackle the ultimate South African trek set two weeks aside for the Drakensberg Grand Traverse. ADVENTURE CALENDAR HIGHLIGHTS: see below for awesome opportunities to enjoy the outdoors this year, Remember ALL of our adventures are available 365 days a year, well, 366 days this year. Follow the links to our website www.govertical.co.za or email us for the full details on any adventure below. Splendid views of the magnificent Amphitheatre, Tugela Falls and hike to the Summit of Mont-aux-Sorces, the highest peak in the area. Climb the highest free standing peak in the Northern Drakensberg 3165m, a rewarding technical Rock Climb. Our Introductory Rock Climbing course is excellent prep for this climb, however if you’re fit, adventurous and not scared of heights we’ll make this an awesome 1st time climbing experience for you! Cathedral Peak standing at 3005m is a great challenge for the fit and energetic. 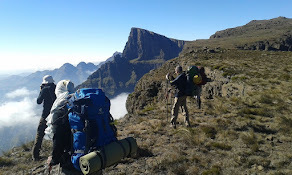 A typical berg hike of 10 hours takes you from the base of the Drakensberg to the top of this spectacular peak and back. An overnight option is available to break this climb into a more comfortable backpacking experience. Hiking and scrambling, no technical experience needed to summit this Drakensberg classic. Tick Mont-aux-Sources 3452m, highest peak in the Northern Berg and The Sentinel 3165m the highest free standing peak in the Northern Drakensberg off your list of summits. M-A-S is a trekking peak overlooking the magnificent Amphitheatre, and the Sentinel is a technical Rock Climb. The nights in between the two are spent camping and exploring the Amphitheatre escarpment. An action packed 5 days of mountaineering skills and adventures, including Rock Climbing, Abseiling, Hiking and Camp Craft for 14 to 19 year olds. Can’t choose between the beach or the berg? Combine both with our Sea and Summit Trails. Hike to the summit in the magnificent Cape Fold mountains, dine in style at an arty town with excellent cuisine and finish off your trip with a superb coastal hike. Three days of the best coastal scenery that the Knysna has to offer, a day of canoeing on the Knysna Lagoon, a stunning beach walk and a rewarding dune hike, no need to carry a heavy pack, we transport all your gear to the accommodation ahead of you. Great food, stunning scenery, well appointed accommodation and invigorating fresh air. Climb the first Rock Climbing Route in South Africa on Towerkop in the Swartberg Mountains near Ladismith Western Cape, lots of trad routes to try out while camping on this gorgeous mountain, we’ll guide, instruct and provide gear, when we’re done climbing we’ll descend and join the festivities in Calitzdorp for the annual Port Wine Festival. The action packed Knysna Oyster festival is a winter highlight, plenty of events such as the Knysna Cycle Tour and the Forest Marathon and of course Oyster tasting. We’ll be offering all our great adventures from Canoeing on the Knysna Lagoon, to Abseiling, Rock Climbing and our relaxing Knysna Slack packing Trail. MONTAGU ROCK CLIMBING 4 - 8 JUNE COINCIDING WITH THE WACKY WINE WEEKEND 7-10 JUNE AND THEN ON 30 JULY TO 2ND AUGUST – NO WINE BUT THE CLIMBING’S STILL GOOD! Climb before you wine and dine! We’ll be guiding climbs in Montagu Western Cape for the days preceding the Wacky Wine Festival. This area is superb with hundreds of excellent Rock Climbing routes, spend a few days learning to climb, improving your grades or learning new skills, we provide the guiding, instruction and gear. Over the weekend you can chill out and sample the very best wines the Roberson Area has to offer. Close to PE is a superb climbing site with great Sport and Trad Routes, we’ll be holding our Introductory Rock Climbing course our Sport Climbing course and plenty of guided climbing get your skills sharp enough to set you up for a lifetime of climbing the crags. WHALE TRAIL 12 – 16 JUNE 2012, AND THEN 22 -26 SEPTEMBER 2013 –NO IT’S NOT A TYPING ERROR…. One of South Africa’s premier Slack Packing trails along the pristine coast of the de Hoop Nature Reserve in the Western Cape. Well known for the whale nursery and spectacular scenery, we’ll be guiding this 5 day tour, cooking us some superb meals and once again all your gear is ferried to your accommodation venue ahead of you each day. Spring time in the Cape is a celebration of life, the whales move into the coastal waters and the dessert give rise to a magnificent display of flowers. We’ll be hiking through some of the most amazing botanical hotspots in the area, the hikes are rewarding in themselves, but coupled with the amazing floral display, the whole experience is fantastic, backpacking and slack packing options available. Email us for details. An awesome adventure in a river gorge in the Magaliesberg! Starting with a sunny hike up the Magalies, we enter the waterway through forest and continue upstream in the cool gorge. After lunch the vertical adventures abound, clambering over boulders, wading through pools, smooth rock bum slide, an abseil down a waterfall and a great plunge pool, this is an adrenalin filled adventure for the fit and adventurous! Abseiling is the best - maximum thrill for minimum effort. No strength or real fitness needed, just a desire for vertical adventure! We'll give you the knowledge, instruction and gear to thoroughly enjoy abseiling all you need to bring is your confidence! Half day adventure near Magaliesburg. Join us in the Magaliesberg and discover your natural talent for climbing. This course is great for beginners and those whose skills have rusted! After teaching you the safety and the rope skills needed to enjoy this challenging sport, you will spend as much time as you like developing your rock climbing ability on the Magaliesberg cliffs. Full day adventure. This is step 2 after the introductory course, a half day at the sport crags to get you climbing and leading with your partner on bolted routes. Short walk in, lots of climbs and more info on gear. Available to anyone who's done our Beginners rock climbing course. A scenic hike to the top of the huge Magaliesberg cliffs, exploring the Escarpment with great views over the valley and beautiful wind sculpted rock formations, soaring vultures and elusive black eagles. Over the edge for Vertical adventure and abseil into the gorge after finding a shady spot you’ve got time to rest and have a bit of lunch before heading back in the afternoon. A full day of Adventure, no experience necessary! A short hike brings you the adventure site, a gorge with great views of the Magaliesberg. Get your adrenalin fix climbing up the cliffs before going back over the edge on an abseil, great opportunity to experience Rock climbing and Abseiling, full day adventure no experience is necessary. Start off your adventure with an awesome abseil overlooking the Crocodile river, then gear up and head for the river. Paddle down the Crocodile River in 2 man inflatable raft towards Hartebeespoort Dam, the rapids are grade 1 and 2 and suitable for anyone. No experience necessary, all gear provided, you don't even need to know how to swim.